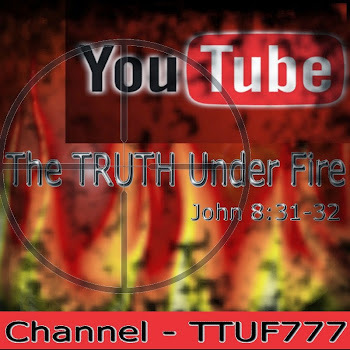 The TRUTH under FIRE: GOD’S CALL TO THE SHEPHERDS of HIS FLOCK. We know of King David, this man after God’s own heart, who was taken by the LORD from feeding sheep; but he never stopped being a shepherd! He was always still a shepherd – the only difference was that rather than shepherding sheep, he became a shepherd of GOD’s people, Israel! Perhaps the flock that the LORD has entrusted you to seems small, and from the view point of this world, very unimportant – but not to God! He sees any sheep – or lamb for that matter that is His, as very precious! He watches with care, how we treat those sheep, how we minister to them, pray for them, etc. For those who are faithful to the LORD’s sheep, He brings them to a place of promotion – as He did with David who watched over a “few sheep”, and later made Him King of Israel! And He holds those accountable who not only let these responsibilities slip, but then begin to abuse and harm His sheep; and He will judge them accordingly – we read about this in EZEKIEL 34 which we will get into later with a wonderful teaching by David Hocking. Give ear, O Shepherd of Israel, thou that leads Joseph like a flock; thou that dwell between the cherubim, shine forth. 2 Before Ephraim and Benjamin and Manasseh stir up thy strength, and come and save us. 3 Turn us again, O God, and cause thy face to shine; and we shall be saved. 4 O Lord God of hosts, how long wilt thou be angry against the prayer of thy people? 5 Thou feed them with the bread of tears; and give them tears to drink in great measure. 6 Thou make us a strife unto our neighbors: and our enemies laugh among themselves. 7 Turn us again, O God of hosts, and cause thy face to shine; and we shall be saved. Two times the LORD is petitioned to turn His people back to Him; three times His people ask Him to shine and three more times He is mentioned as the One to save Israel. Salvation is something wholly of the LORD - there are none who of their own accord seek God (ROM 3:22); but by the prompting of the Holy Spirit (JOHN 16:14; 1 COR 12:3; EPH 3:4-6), and God the Father (JOHN 6:44), they are drawn to the LORD Jesus, are confronted with the truth of the Gospel - and must make a choice whether to receive salvation or refuse it (JOSH 24:15; JOHN 1:12-13; ACTS 16:31). The LORD is faithful towards His own, bringing chastening and correction whenever necessary to draw His people back to Himself; we see this everywhere in the Old Testament with the nation of Israel -(read for an example: PSALM 107) and they are a model example for us the church (ROM 15:4; 1 COR 10:10-12). A faithful shepherd is one who will always lead God's own back to Him; they will always provide the revelation of God’s Light to show them the way. Such faithful shepherds will declare God’s salvation without compromise, without diluting the message! Again, a faithful shepherd will also provide correction as needed, but out of a heart of love and compassion for the LORD’s sheep. The Lord is my shepherd; I shall not want. 2 He makes me to lie down in green pastures: he leads me beside the still waters. 3 He restores my soul: he leads me in the paths of righteousness for his name's sake. 4 Yea, though I walk through the valley of the shadow of death, I will fear no evil: for thou art with me; thy rod and thy staff they comfort me. 5 Thou prepare a table before me in the presence of mine enemies: you anoint my head with oil; my cup runs over. 6 Surely goodness and mercy shall follow me all the days of my life: and I will dwell in the house of the Lord forever. Only a shepherd can truly love sheep! Sheep are rather dumb. If one walks off a cliff to their death, the others will follow the leader, without any thought of what just happened to him! Sheep are high maintenance: if they have a thick coat of wool and they get caught out in the rain, they get very top heavy, and if they fall over on to their backs, they can’t right themselves. Sheep will graze and graze until there is nothing left to eat, but they haven’t enough smarts to simply move on to greener pastures, but will starve on the land whose vegetation is all consumed! Sheep can be quite stubborn at times too – and if they find the tiniest breach in a corral, they will squeeze through it and escape safety, and quickly lose their way as soon as they cross over the hill top, not knowing the way back! So the shepherd must be devoted to his sheep, patient, watchful, knowing when to demonstrate mercy and when to administer discipline. The shepherd must always be on the lookout for predators and able, and ready to defend his flock. The rod and staff of the shepherd are comforting: the rod is used in the guarding of the sheep, a weapon to strike down the predators of these beloved creatures; the staff is used in the guiding of the sheep, steering them towards provender, watering, and restful places of green pastures to lay down in. We find no greater example of a model shepherd than the Good Shepherd, the LORD Jesus Christ – so without any further delay, let’s turn to JOHN Ch. 10! Verily, verily, I say unto you, He that enters not by the door into the sheepfold, but climbs up some other way, the same is a thief and a robber. 2 But he that enters in by the door is the shepherd of the sheep. Two people are here identified: the 'robber/thief' and the shepherd. They are marked by the way that they go in order to gain access to the sheep. The shepherd goes by the door, which is the legitimate “way” to the sheepfold; the robber/thief goes by “some other way”. They must climb over a wall, and by so doing, they are exalting themselves. A true under-shepherd of Jesus Christ never exalts himself, but only Christ – and Him alone (LUKE 18:14)! Any true shepherd will enter in among God’s sheep by the way, just as our Chief Shepherd (the only ‘senior pastor’ as written in the Scripture, 1 PET 5:4) is Himself “. . . the Way . . .”. 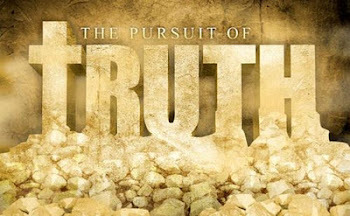 False shepherds – who are in fact robbers and thieves, taking possession of that which does not belong to them, neither by purchase – Jesus purchased us His sheep by His blood (ACTS 20:28) – nor by stewardship – those that God has accounted as acceptable as His ‘under-shepherds’ (2 COR 3:1-6). There are those who are self-appointed authorities in today's world, who claim to speak for God in the church, but are actually enemies of the cross (PHIL 3:18-19) and have risen up in our midst to draw others away from the Good Shepherd and into error and apostasy (ACTS 20:29-31; 2 PET 2:1). The way to God’s sheep is by the door – which as we shall see, is also Christ Himself. 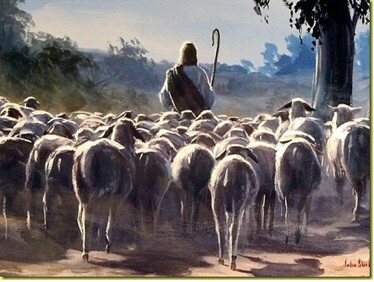 3 To him the porter opens; and the sheep hear his voice: and he calls his own sheep by name, and leads them out. 4 And when he puts forth his own sheep, he goes before them, and the sheep follow him: for they know his voice. 5 And a stranger will they not follow, but will flee from him: for they know not the voice of strangers. There are a few different views as to who the porter is in this parable: some see him as the Father, the One that Jesus followed and obeyed; others see Him as the Holy Spirit Who goes before the Shepherd, preparing the way for Him. Either one works for me. We have here something amazing: shepherds may routinely corral their sheepfold with other sheepfolds of other shepherds. To you and I, all of these sheep would look alike – how would we separate these sheep so that when it was time to leave the corral, we would take only those that are ours, and not take others that belonged to other shepherds? Sheep actually only respond to the voice of the shepherd that they recognize! So when their shepherd calls, only those that are his respond. The other sheep stay where they are! How amazing indeed that God instilled this characteristic in the nature of these creatures as an object lesson for us, His flock! And so it is spiritually among God’s sheep! One of the ways that one can tell a sheep of God’s apart from those that belonged to any others is that they hear the Word of the LORD: they recognize the voice of their Shepherd through the Scriptures, and follow His leading as recorded in these Holy Pages of Truth! 14 For we are made partakers of Christ, if we hold the beginning of our confidence steadfast unto the end; 15 While it is said, Today if ye will hear his voice, harden not your hearts, as in the provocation. Another characteristic of sheep: they follow after their shepherd that goes before them and leads them at the head of the flock. Goats are very different: they are not led by their shepherds at the head of the flock; rather Goat herders drive their goats from behind. This difference is significant in a special way: you see, sheep are led, but goats are driven. Anyone read a popular book by the name of The Purpose Driven Church? That title is most telling, I must say! 6 This parable spoke Jesus unto them: but they understood not what things they were which he spoke unto them. 7 Then said Jesus unto them again, Verily, verily, I say unto you, I am the door of the sheep. 8 All that ever came before me are thieves and robbers: but the sheep did not hear them. 9 I am the door: by me if any man enter in, he shall be saved, and shall go in and out, and find pasture. There was only ONE tree of Life in the Garden of Eden. There was only ONE door in Noah’s ark; any who would seek salvation from the coming flood would have to enter in there – there was no second door. There was only ONE way that led into the Temple’s Holy Place and the inner chamber the Holy of Holies – there wasn’t a multiple choice! Likewise, there is just ONE door, ONE way to salvation – and that is Jesus Christ; despite what this world believes, despite what Oprah Winfrey teaches, there are not “millions of ways to God” but only One! Salvation is very narrow in that there is only One Person we can go to for it (JOHN 6:68). Salvation is very broad in the sense that “whosoever will” let them come unto Jesus to acquire rivers of living water. Satan and sin: both are thieves that steal those things that God would give us (MATT 13:19), kill the life and quality of life that God intends for us (MATT 13:22), and destroy those things that we would build in life that is in accord with the will of God (1 COR 5:7-8). Jesus is not the Blessed Benefactor that gives just life, but abundant life! And He can’t grant this Life apart from Himself for He Himself IS this Life (JOHN 14:6). Jesus is not merely a skillful, sacred shepherd; a competent, capable and kingly shepherd, and an experienced shepherd, but He is THE Good Shepherd (Who is God because there are none who are truly good except God Himself; MARK 10:18) that lays His Life down for His sheep. Because He is good and so full in loving devotion to our care, we never need to question His heart or His leading, even if where He leads us seems to be uncomfortable or even dangerous, like " . . . the valley of the shadow of death . . .(PSALM 23:4)". Since He is good, He is 100% trustworthy. 12 But he that is a hireling, and not the shepherd, whose own the sheep are not, sees the wolf coming, and leaves the sheep, and flees: and the wolf catches them, and scatters the sheep. 13 The hireling flees, because he is a hireling, and cares not for the sheep. Shepherds tend God’s flock because they love those who God loves; they mirror His heart in regards to His people – the singular motivation for the shepherds is their love for sheep, just as God loves them. Hireling’s have an altogether different motivation – they tend God’s flock for the money, for the prestige and sense of power, being in the lime light, to be esteemed by others – and just as EZEKIEL 34 declares, these hirelings – or false shepherds, will actually take advantage of God’s sheep, or even abuse them. When danger comes, the hireling will abandon God’s sheep, whereas the shepherd will lay down his very life for his sheep! These hirelings, these false shepherds will even go so far as to abuse God's own sheep: we see this repeatedly among today's 'televangelists' who are in it for the money, fleecing - not feeding God's flock. And how is it that they can do this. continue to do this, and not repent before the LORD? IT IS BECAUSE THEY HAVE NO FEAR OF GOD!!! THEY ARE THEREFORE BEREFT OF GODLY WISDOM (PSALM 111:10)!! 14 I am the good shepherd, and know my sheep, and am known of mine. 15 As the Father knows me, even so know I the Father: and I lay down my life for the sheep. 16 And other sheep I have, which are not of this fold: them also I must bring, and they shall hear my voice; and there shall be one fold, and one shepherd. 17 Therefore doth my Father love me, because I lay down my life, that I might take it again. 18 No man taketh it from me, but I lay it down of myself. I have power to lay it down, and I have power to take it again. This commandment have I received of my Father. Here we see familiarity, even intimacy between the Good Shepherd and His sheep; He knows them and loves them, just as they know Him and love Him. As the Father knows the Son and the Son knows the Father. This knowledge is not a knowledge of information, but of persons. You can have information about George Washington, but you can’t know him personally. To know God Personally (not just have information about God), is to possess eternal life (JOHN 17:3), and such knowledge is intertwined with our love for God, and His love for us. 19 And to know the love of Christ, which passes knowledge, that ye might be filled with all the fullness of God. This kind of knowledge and love is where we find unity with one another as saints, which is growing to the level of the Father’s unity with the Son (JOHN 17:22), which is exactly what our LORD prayed for! This love is sacrificial, where the Son willingly lays down His life for the sheep, and this love, like this knowledge and unity as found in the saints, allows us to lay down our lives sacrificially for one another (1 JOHN 3:16). For the most part, the Pharisees, scribes, lawyers and Sadducees were hirelings (MATT Ch. 23), and so their attitude and conduct towards the LORD Jesus was that of envy and strife – and just as today, people are divided over their view of Jesus. Some see Him as Savior and the Good Shepherd, others see Him as just about anything other than what He truly is! One can divide the world into two groups: One group is His sheep, the other are the goats that are not His (MATT 25:32-33) . . .
22 And it was at Jerusalem the feast of the dedication, and it was winter. 23 And Jesus walked in the temple in Solomon's porch. 24 Then came the Jews around about him, and said unto him, How long do you make us to doubt? If you be the Christ, tell us plainly. 25 Jesus answered them, I told you, and ye believed not: the works that I do in my Father's name, they bear witness of me. The feast of dedication – Hanukkah, was a celebration of the cleansing of the Temple, back in the days of Antiochus Epiphanes – a Greek king of the Seleucid Empire who reigned over Syria from 175 BC until 164 BC. He made a decree outlawing Jewish rites and worship, ordering the Jews to worship Zeus rather than Yahweh and then raided the temple in Jerusalem, stealing its treasures, setting up an altar to Zeus, and sacrificing swine on the altar! The Jews were so unhinged by the blasphemy, “the abomination that makes desolate” as it was called (DAN 9:27;11:31;12:11; MATT 24:15), that the Maccabean family led a victorious revolt against his reign, freed the nation for a time, and cleansed – and rededicated the Temple! The Good Shepherd of Israel, in these last days, will likewise guide those sheep that He knows are His, and lead them away from the destruction that the Beast of Revelation will intend for them (REV 12:13-17) and these will refuse to worship His image "the abomination of desolation". It was on that day that Jesus walked into the Temple to Solomon’s porch, and declared that God was His own Father (being the equal to the Father, thus declaring that He is God also – vs. 30) and spoke of His sheep as well as His “other sheep” in verse 16. The strife and turmoil between the Jews and the Gentiles would be done away with, as they would hear the LORD’s voice, follow Him to salvation and become “one fold” – the church; under “one Shepherd” – the Head of the church, the LORD Jesus Christ (EPH 2:13-15). 28 And I give unto them eternal life; and they shall never perish, neither shall any man pluck them out of my hand. 29 My Father, which gave them me, is greater than all; and no man is able to pluck them out of my Father's hand. 30 I and my Father are one. Our Good Shepherd will safe guard us, His beloved sheep, so that we will never perish; we have His promise on that, just as He declared before the Father in JOHN 17:12.